Health experts meet in Memphis to discuss ending the H.I.V. epidemic. Experts from across the country are convening in Memphis this week to talk about efforts to end the H.I.V./AIDS epidemic in Tennessee. It's a meeting of the National Association of State and Territorial AIDS Directors (NASTAD), a Washington, D.C.-based nonprofit that aims to end the overlapping epidemics of H.I.V., viral hepatitis, and related conditions. The group will strategize, plan, and discuss Tennessee's work to reverse the H.I.V./AIDS and hepatitis epidemics here through strengthening governmental public health. H.I.V. risks in the U.S. The 23 board members will touch on topics like modernizing Tennessee's H.I.V. and hepatitis laws and syringe-access services. They'll also review H.I.V. care models, like the Ryan White H.I.V./AIDS program, a comprehensive treatment that provides primary medical care and support services to the uninsured. As a part of the program, a campaign was recently launched in Shelby County to increase access to pre-exposure prophylaxis, an H.I.V. prevention drug. The group's Unite to End the Epidemics challenge calls on health departments to create or improve current H.I.V. and hepatitis programs and policies that work to end the epidemics. For this, they point to the Ryan White program, which is especially effective in ethnic communities and groups disproportionately impacted by the epidemic, such as gay men and transgender women. "It calls on health departments to stop allowing the imperfect nature of our systems to divide us and unite to further the necessary work to put in place program and policy building blocks needed to implement impactful H.I.V. and hepatitis prevention and care programs," chair of NASTAD's board Shanell McGoy said when the challenge first launched in May. McGoy, also the director of the Tennessee Department of Health's H.I.V./STD program, said the campaign not only focuses on providing access to programs and resources for those diagnosed with H.I.V./AIDS, but also on ensuring there are opportunities for "the most vulnerable among us" to thrive and live well. The South is the most vulnerable region in the country, according the Centers for Disease Control and Prevention. It suffers from a higher rate of H.I.V. diagnoses than any other U.S. region, and more than half of those diagnosed with the virus are African American. In Tennessee, the lifetime risk of being diagnosed with H.I.V. 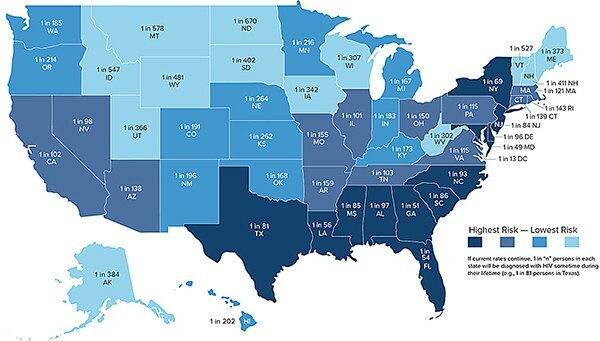 is one in every 103 people — a slightly higher risk than to the west in Arkansas, where it's one in 159 people, but lower than just south in Mississippi where one in 85 individuals are diagnosed with the virus in their lifetime. The Memphis metro area however had the eighth-highest H.I.V. diagnosis rate and number of people living with the disease in the country last year. Murray Penner, executive director of NASTAD, said that's the reason he wanted this year's NASTAD board meeting to be in Memphis. "Nearly 2,000 people here are living with H.I.V. and don't know it," Penner said. "I truly believe we're on the cusp of ending H.I.V. and AIDS, but to get there we have to have an all-hands-on-deck approach to educating the public, eliminating societal taboos, and providing access to comprehensive health care."